He was born in the town of Domanivka in the south of Ukraine on December 16, 1967. He began to play guitar after 12 years. The first “Secunda” group was created at the school, where, under the influence of world and domestic rock, they began to create their own songs. They spoke at school evenings and dance floors. In 1985 he graduated from the school and entered the Odessa Institute of Marine Engineers. He finished the first year and was called to serve in the army. Fortunately, the army years, too, were “musical”. Young soldiers created their own group, it was an outlet after the gray soldiers’ everyday life. After the service he returned to the institute, but all attempts to become a marine engineer were reduced to dreams of a musical future. In 1990 he enrolled in the Mykolaiv College of Culture, specializing in the head of the People’s Choir. In the same year the group “Rock Liceum” was created, which successfully toured, created new songs and clips. 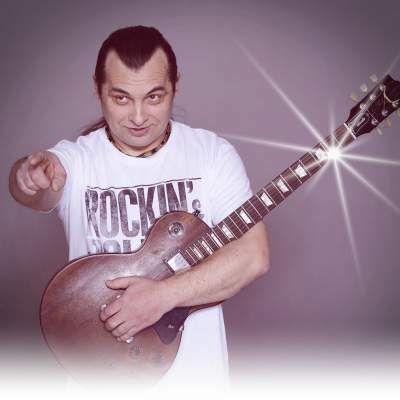 In the search for creative forms in 1998, with the keyboard player of the group “Rock-Liceum”, the group “Aktsiya” was created, with which several music albums were recorded. The next creative stage of the musician began in the capital of Ukraine – Kiev. Here in 2003, a cover band “Lazy Town” was created, which performed world music hits. Acquaintance with the English musicians and their offer to play together resulted in the creation of the Ukrainian-English group “DVS” (2004). As a result of the unification of the two cultures, three albums were recorded, several sensational clips about miners, bikers. The group “DVS” toured in America, England, Hungary, Georgia, Russia. For many years of musical creativity, ideas for creating instrumental music accumulated, which today is born for you by dear listeners. He writes intense Rock instrumentals with bone-crunching lead guitar work. Also writes songs in the New Age, Ambient, Lounge, Dance and Pop genres.